When a monster decides to spare the life of a child, he changes the fate of kingdoms, curtails an expanding empire, restores a lost royal dynasty, and most especially, alters his own life forever. Ja’kh’redd, a monstrous Vidos, was out hunting when he came across an orphaned human child amidst the ruins of a recently destroyed caravan. Taking pity on the ‘human cub’ he saved her, attempting to return her to humankind to grow up among her own. A decade and a half later, Ja’kh’redd would come across the same human cub once more, this time grown to adulthood… and on death’s door. Rescuing her a second time from a fatal wound begins a journey that will take the humble Vidos from the life of a simple hunter to the halls of ancient Kings, the feasting table of conquerors, and into a life he never could have imagined. With a strange but elemental love story as its backbone, Kings and Monsters is ultimately a story about humanity, compassion, and what makes a soul noble… and it isn’t the color of the skin, or whether or not there are horns. Of Kings and Monsters has not been tagged yet. 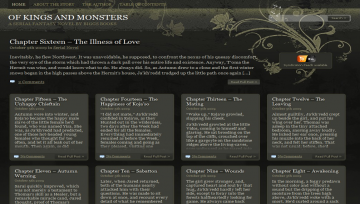 Help others find Of Kings and Monsters by tagging it! Of Kings and Monsters has not been reviewed yet. Of Kings and Monsters has not been recommended yet.